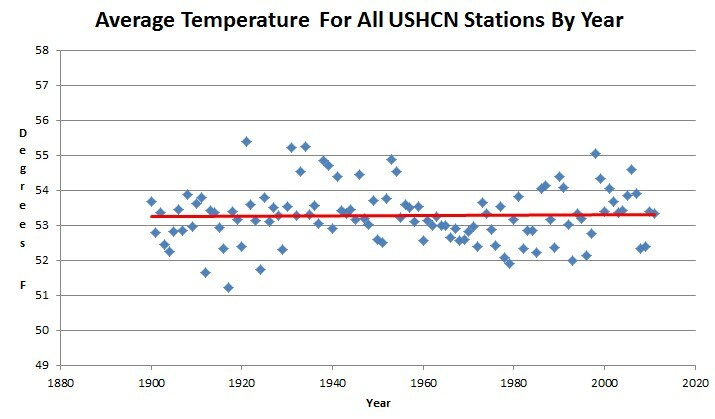 The graph below plots the average temperature (by year) of all valid daily maximum and daily minimum readings, for all USHCN stations since 1900. As you can see, there has been no warming in the US, and the three hottest years (in order) were 1921, 1934 and 1931. Also note that 2008 and 2009 were two of the coldest years on record in the US. February 04, 1989 Last week, scientists from the United States Commerce Department’s National Oceanic and Atmospheric Administration said that a study of temperature readings for the contiguous 48 states over the last century showed there had been no significant change in average temperature over that period. Dr. (Phil) Jones said in a telephone interview today that his own results for the 48 states agreed with those findings. The US has the best temperature record in the world. There was no valid reason to tamper with it. You can see the changes that GISS made after the year 1999, in the blink comparator below. Someone near his office needs to make a citizens arrest for felony fraud. Sounds more like kidnapping. You know I’d do it if the money was right, but who would pay to get Jim Hansen back? Ain’t nobody on this planet. I’ve often thought that even the TOBS adjustment, the largest impact of all, was completely off base. The 3 O’clock reading is generally going to be somewhere near the high of the day, but if you reset at 3, there is little chance you would catch it at the peak, since chances are, you will be a little early or a little late. So any good observer, way back when (who was probably doing other work to keep themselves alive at 3 O’clock anyway), would have learned to simply reset sometime well after the peak (like 9 PM or midnight). Correct? And newspapers of the day still published highs and lows, no? It makes a lot more sense than publishing the temperature at 3:00. So it would appear that no one was following the reset procedure anyway since it would not give a high or low. Or maybe there were a few that did, so you now need a probability distribution of the likelihood of records being taken at the procedurally correct time, or the realistically correct time. With enough time, one could probably deduce from other nearby records whether a specific observer was an obedient, “take the record at the time specified” type of person, or whether he was a little smarter, and simply recorded the observed high and low. This would have been controversial either way back then I suppose. I wonder if any of them ever imagined that the future of a world they could not possibly imagine, depended on them taking the temperature of some rural cow town correctly (which is now as big as Chicago, with a UHI of 10 degrees). Absolutely. I had a min/max thermometer when I was about seven years old, and it only took about three days to realize that you have to reset the thermometer at night. The geniuses at USHCN act like TOBS is some subtle problem they discovered. There is nothing subtle about it. Anyone using a min/max thermometer will figure it out in a matter of days. This looks very interesting and seems to mirror the basic structure of the global HADCrut3 record. A warm 20-30’s period. A cooler period in the 60’s. Warming again from 1980-2000 and then some levelling off and possible cooling. I summed/averaged all stations and it appears that almost all years are cooled in the adjusted data set, it’s just that the more recent years are cooled less. Recent years are cooled by about .1 of a degree, while in the distant past (30’s, 40’s) the temps are effectively cooled by as much as 1/2 a degree. It seems like the thermometers of the past just didn’t know how cold it was. Good thing we have people hard at work to correct that. CFC’s don’t account for jack in the Earth’s greenhouse effect. Didn’t CFC’s make that hole in the ozone layer? Is it still possible to obtain the raw, untainted USHCN data? If so, where can I find it? Yes, I included the link in the article. According to U.S. Weather Bureau data, in 1942 the average temp (degrees Fahrenheit) for the contiguous United States was 53.2′ (http://docs.lib.noaa.gov/rescue/mwr/070/mwr-070-12-0271.pdf). According to NOAA, “In 2014, the contiguous United States (CONUS) average temperature was 52.6°F,” (https://www.ncdc.noaa.gov/sotc/national/201413). So, how can 2014 be the hottest year ever, when in fact 1941-1944 were each hotter years on average?